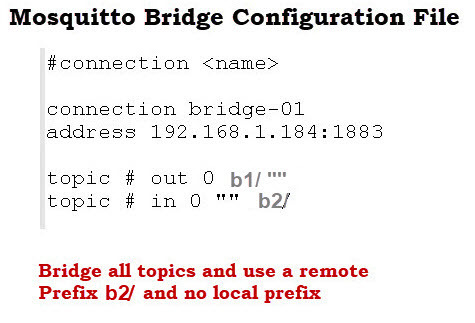 The Mosquiito broker (server) can be configured to work as an MQTT bridge. 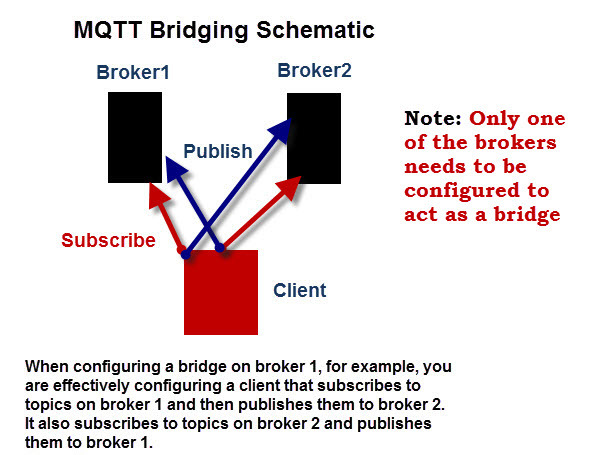 A bridge lets you connect two MQTT brokers together. They are generally used for sharing messages between systems. A common usage is connect edge MQTT brokers to a central or remote MQTT network. 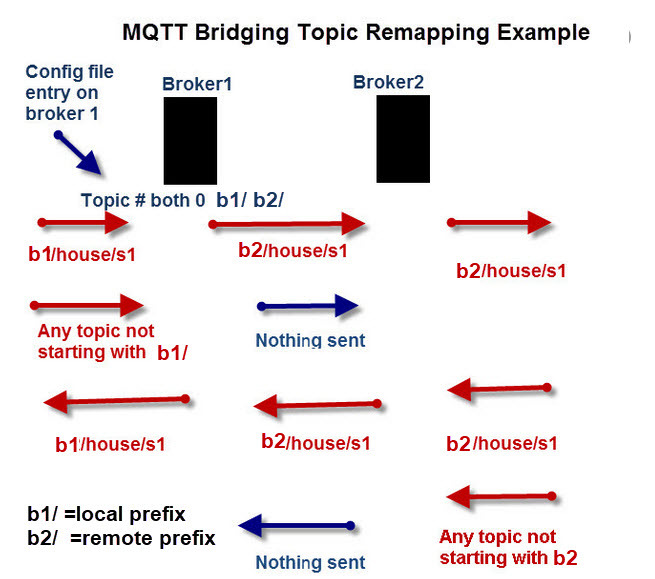 Generally the local edge bridge will only bridge a subset of the local MQTT traffic. In addition you only need to configure 1 of the brokers to act as the bridge, the other will act as a normal broker. 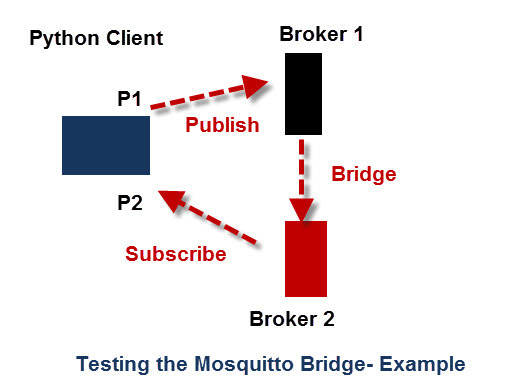 When you configure the mosquitto broker as a bridge it becomes an MQTT client and subscribes and publishes to topics on the other broker and itself depending on the entries in the mosquitto.conf file. Note: You can configure multiple remote broker addresses and the broker will switch to another broker if the current broker connection fails. What topics are being bridged and if they are being remapped is controlled by the topic entry. topic topic pattern direction QOS local prefix/remote prefix. Direction can be out,in or both. The screen shot below shows how to bridge all topics with no remapping. When a Client connected to broker 1 publishes on any topic that message will be sent to broker 2 . Example incoming message on topic house/sensor1 are published to broker 2 on topic house/sensor1. When a client connected to broker 2 publishes a message then messages published on any topic are sent from broker2 to broker 1. Topic remapping is accomplished using topic prefixes. The topic prefixes follow the QOS entry. When a Client publishes on any topic that message will be sent to broker 2 with the topic prefix b2/. Example incoming message on topic house/sensor1 is published to broker 2 on topic b2/house/sensor1. Broker2 is functioning as a normal broker (not a bridge) and doesn’t normally need any extra configuration. This is accomplished using the local and remote prefixes. The following diagram illustrates the general process. The following examples refer to the schematic above with two brokers broker1 and broker2 . Broker1 is configured as the bridge. Normal clients will also be connected to both brokers. Incoming messages from a client connected to broker1 to a topic house/sensor1 are being bridged and will be sent to broker2 on topic house/sensor1. Incoming messages from a client connected to broker2 on the topic house/sensor1. will be sent to broker1 on topic house/sensor1. Incoming messages from a client connected to broker 1 on the topic house/sensor1 are being bridged and will be remapped and sent to broker2 on topic b2/house/sensor1. Incoming messages from a client connected to broker2 on topic b2/house/sensor1. will be sent to broker1 on topic b2/house/sensor1..
Broker1 removes the b2 prefix and will send them to clients subscribed to house/sensor1 on broker 1. Incoming messages from a client connected to broker1 on topic b1/house/sensor1 are being bridged and will be remapped and sent to broker2 on the topic b2/house/sensor1. Incoming messages from a client connected to broker2 on the topic b2/house/sensor1. will be sent to broker1 on topic b2/house/sensor1. Using the configuration shown above on broker 1 I am going to publish a message to broker 1. 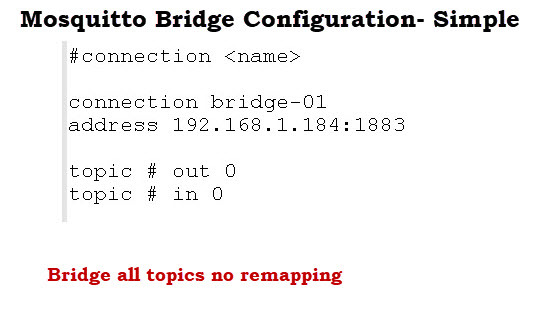 Broker 1 has the bridge configured to connect to broker2 (IP address 192.168.1.157). Broker 1 accepts messages and publishes them to broker 2 with a prefix of b2/. When you start the broker on broker 1. It connects to broker 2 and subscribes to the topics b2/#. When I run the script this is what I see. Broker 1 receives message on topic house/sensor1 and publishes them to broker2 on b2/house/sensor1. Broker2 receives messages on b2/house/sensor1 from broker1. I can also publish to broker 2 on topic b2/house/sensor1 and it should be sent to broker 1 and made available as house/sensor1. So now I will alter my script to send to broker 2 on topic b2/house/sensor1 and subscribe to house/sensor1 on broker 1. Here is a screen shot of the results. Topic remapping takes an incoming topic and renames it. E.g A broker would receive messages to topic sensor1 and remap them to new_sensor1. Currently this form of remapping is not available, but prefix remapping is as shown above. Topic republishing is done using an MQTT client and not a broker. It can be used for more sophisticated remapping schemes but generates more traffic. See this python code example. It is possible to bridge to another broker in the event of a broker failure. will use broker 192.168.1.185 if the connection to the first broker (192.168.1.168) fails. If the remote broker requires a username and password then you need to enter this using the remote username and remote password options. You can also encrypt the connection between the brokers. This is likely to be a common configuration and Is covered in more detail in the Configure Mosquitto Bridge With SSL Encryption- Examples tutorial. Publishing and subscribing to the same topic on the broker could result in a loop. However if you try this you find that a broker detects that another broker sent the message, and doesn’t send the message back to it even though the broker has subscribed to that topic. This confused me at first as looking through the specs I couldn’t find any reference for broker detection. I did find this comment from Roger Light on a forum that explains it. I had a request for help regarding bridge configuration on mosquitto when creating a bridge to thingspeak. When configuring bridges you may encounter some issues. Here are some of the errors I’ve encountered. Cause – Configuration file error. In my case it was the PSK setting. Problem – Remapping not working as it should. Implementing SSL on the mosquitto broker. Feb 20 21:17:03 rsb mosquitto: Starting network daemon:: mosquitto. Feb 20 21:17:03 rsb systemd: Started LSB: mosquitto MQTT v3.1 message broker. Feb 20 21:17:03 rsb mosquitto: Config loaded from /etc/mosquitto/mosquitto.conf. Feb 20 21:17:03 rsb mosquitto: Opening ipv4 listen socket on port 1883. Feb 20 21:17:03 rsb mosquitto: Opening ipv6 listen socket on port 1883. Feb 22 08:04:29 rsb mosquitto: Saving in-memory database to /var/lib/mosquitto/mosquitto.db. Feb 22 09:31:32 rsb mosquitto: Starting network daemon:: mosquitto. Feb 22 09:31:32 rsb systemd: Started LSB: mosquitto MQTT v3.1 message broker. Uncommenting strings above gives same result. Feb 28 23:29:02 rsb mosquitto: Starting network daemon:: mosquitto. Feb 28 23:29:02 rsb systemd: Started LSB: mosquitto MQTT v3.1 message broker. 1551551862: Received CONNACK on connection rsb.mybridge. Socket error on client rsb.mybridge, disconnecting. Steve, what I must write in line “topic..” ? Thanks! This my problem is solved. I confused subscribed messages and the messages which are written down in mosquitto.log. For some reason messages come to the mosquitto.log without filtration according to topic. Thanks for your attention! But it doesn’t seem to work properly. Any ideas on if I can do what I want and what am i doing wrong? I have had others complain of bridge problems with mosquitto 1.5.4. I haven’t had chance to test it but it is probably nothing you are doing wromg. How to establish a TCP Bridge connection. Trying to TCP Bridge Mosquitto with EMQ. The IP address mentioned above is an IP of a different system. And also setup the port at 2883. But the very rarely does the connection happen. It fails 95% of the times. If that doesn’t work make sure that you can connect to emq using a normal client as it might have other restriction e.g authentication configured. 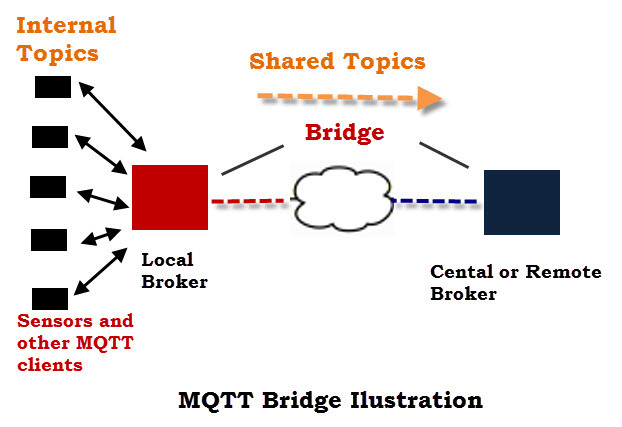 This is a very good post on MQTT bridge. TYou have given tips Encryption which is very useful for the user. They are able to make a bridge to connect with each other. Hi steve, can we increase client connection limit from default 1024 to 10,000 in mosquitto? I don’t find a proper solution from internet…so, it would be great for me if you can help in this problem..
From what I understand you can use -1 and have unlimited connections but the docs say that you might hit problems when you go over 1024. # a per listener setting. # Default is -1, which means unlimited connections. # connections possible is around 1024. I am using Mosquitto MQTT Bridge between local gateway & remote MQTT broker server. It is working fine but when internet connection down then all topic published locally will not publish to broker when reconnect to internet even though QOS level is set to 2 and clean session flag is false so how can I ensure high quality of level between local MQTT bridge & remote MQTT broker without making retain topics. Is there any configuration from which local MQTT bridge ensure all topic sends to remote MQTT broker as or when internet connection resume? It is not just the QOS on the bridge. Yoy need to be publishing to the bridge with a qos of 1 or 2 and subscribing on the remote broker with a qos of 1 or 2 and it should work. You should also note that mosquitto has a limit of 100 messages (default) setting that it will hold in a queue. Started normal broker first(broker1) and then bridge broker (broker2) later. Used mosquitto_pub and mosquitto_sub to verify. Broker2 subscribes to all messages from broker1 with no prefix, is that correct ? I thought there would be /b0 this case as well. No broker2 should subscribe to broker 1 using the prefix. When you publish a message to broker1 then any message not beginning with the prefix b0/ isn’t sent to broker2. 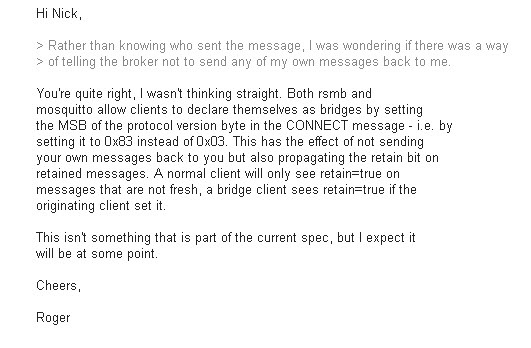 When you send a message to broker2 it should send it to broker1 with the prefix. In this case the prefix is both ways in and out. If i use bridge,my brokers can 20k users? Great article. Quick question. Is there a practical limit to the number of brokers that can be bridged? In my project, I will have 100s of remote mqtt brokers. I’d like to pass status information from the remote brokers to my main cloud broker. The above configurations work great, but I’m unsure if there is a limit to the number of bridge connections (assuming the could version has the power to handle all of the incoming messages) a single instance can support. Shouln’t be a problem as the cloud broker sees client connections it is the edge broker that is configured to be a bridge. The edge broker only needs to support 1 bridge to the cloud broker or 2 if you want a standby cloud broker. It sounds like a networking problem. Can you ping it? Do you have a firewall between the machines? Thanks Steve for prompt response.solved. I am trying to setup mosquitto cluster. Is it possible to achieve High availability(HA) and Load balancing(LB)? As per my understanding, If I want to have cluster setup at cloud for HA and LB where mqtt gateways can publish data. It is not possible with mosquitto to achieve . Better I should choose another mqtt broker which gives HA/LB support and suitable for cloud. I haven’t looked at clustering mosquitto but I’ve seen several comments around the web saying you can’t do it. Where are you getting the error? Does it occur on the broker that the bridge is trying to connect to? Do you have any security configured on the broker? Is bridging suitable for HA architecture where I want to have say three brokers that all share clients’ data?My concern is that it seems that even with Round Robin there is only one bridge so if that bridge broker goes down then HA breaks – am I missing something? You’re correct the bridge is the weak link. The only alternative is to get the clients to publish to two brokers but that isn’t really practical. Bridging doesn’t give you any kind f resilience it is only meant to connect brokers together so that they can share topics. Edit the config file and start by bridging all topics. Once it is working ok then you can change it to only bridge selected topics. Where does the b2 come from? I see no mentioning of b2 in the simple config. b2 is the remote prefix.The prefix is only used if you want topic remapping.You can use any prefix you want b2 is just an example. I’ll reread the tutorial over the next few days and check to make sure the examples are OK as I remember when I was doing it it got confusing. I am newbie in MQTT. I am using a Mosquitto broker in my laptop for home automation applications. It has worked well for local network but not for remote one. Could you guide me to configure the Mosquitto broker in order to access from outside network? Alternatively you could use one of the free online brokers. Many thanks for the help and it works great. Very nice explanation on how to get this done. Could you please explain how to do this if say broker 2 has a username and password set up or TLS? Is it possible to configure in Broker 1, which is being used as the bridge a user name and password so it can access broker 2’s topic and publish to it? Thanks and expecting your reply soon. For username and password authentication the broker that is acting as the bridge needs to use the remote username and remotepassword options. I will be edit the tutorial to cover this shortly. Thanks for the quick response. I will be checking for the update, as I am in the middle of trying to develop my system now. I am just putting together this configuration, but I don’t seem to understand where this configuration is to be. Is it a different script, or this is to be inputted into the mosquitto.conf file found in /etc/mosquitto/. Please is there something I am missing? Sorry had to send it again, as some text went missing in the last one I sent, and seems I can’t edit. can you help on below issue , as my another bridge server denied publishing the data. I would look at the topic name as I’m not sure about the comma. Then I would see i the bridge as an access control list configured as that is when I’ve seen the publish denied message. What broker are you using for the bridge?